I’m very grateful to Linda Frost for bringing my work to the attention of visitors to Ragged Cloth Cafe. I also greatly appreciate the feedback in the responses to her article. I’ve not thought of myself as a textile artist, having worked in a variety of mediums, in fact think of myself as relatively inexperienced with textiles and sewing techniques, so I’m especially pleased to have these comments from the experts. Your “thread” has left me with a great deal to think about. Thank you! Clairan – The items you refer to are “merkins” which at some time in the past were wigs for a woman’s pubic area. The exhibit was in Kansas City, MO, for 1997 Surface Design Symposium. I thought they were wonderfully witty, but some viewers found them disgusting. Each to her own, eh? I also see that my dyslexic proofreading-challenged brain made a whole batch of errors in the above message. I’ll clean it up. It’s that kind of day. I was just thinking the same thing, only in reference to Terry’s observations about the kind of mind that can see these transformations. It’s one part of visual art that grabs the viewer, I think — taking something we think we know and seeing in it new visual possibilities. And when those possibilities are tied to interesting ideas that reflect both the old and new, well, that’s one definition of art, I suspect. I get claustrophobic thinking about gloves — and girdles. Imagine how insane I would have been with chastity belts! “To see them now as escape rather than containment bemuses me.” Jusst as many women artists use corsets as the basis for art about confinement and freedom — sexual or otherwise. There was recently an exhibit of art by women in FiberARts that was like chastiy belts, I can’t remember what they were called. I’ve seen more than one exhibit in Australia based on high button shoes. Isn’t it a wonder that our imaginations can be so transforming and liberating? I am fascinated by the kind of mind that sees these transitions from one form to another. It seems a very special kind of creative impulse. I wish I could think of other examples, but I know I have been confounded by this thought before. Besides the cleverness of the work, it is quite beautiful, IMO. 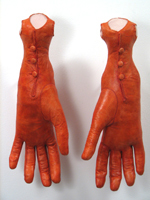 The skill she employs in the sculpting of body parts from the leather of the gloves is what makes it really work. You don’t get distracted by puzzling out what those things are supposed to be–clearly legs, torsos, whatever, then you can puzzle out the transition and how that happens. The first image grabs me both for its morphing from one thing to another (as your analysis points out) but also because of the oval form that is made from the morphing. It seems to be a seamless (forgive the pun) integration of a number of ideas. Using gloves to suggest flesh is ingenious, although perhaps it is post-1950 to imagine gloves being “role-playing.” I remember when gloves were still absolutely necessary for church- and prom- going, and prior to that they were essential for all ladies. It was a way of declaring your financial class — ladies wore gloves whenver they went out — and there were strict etiquette rules about when they could be removed. My memory of gloves (which were mostly from the 50’s) is that even the smooth cotton ones felt confining. I wore them but lost them, dirtied them, hid them — all the ways a 10 year old can sabatoge something her aspiring middle-class mother wanted her to be. Not that I minded being a lady — I just hated wearing gloves. To see them now as escape rather than containment bemuses me. I am also impressed that Watson got a Pollock-Krasner Foundation Grant — this is really an honor and difficult to achieve. It tells me again that some textile art is making it in the fine arts world.